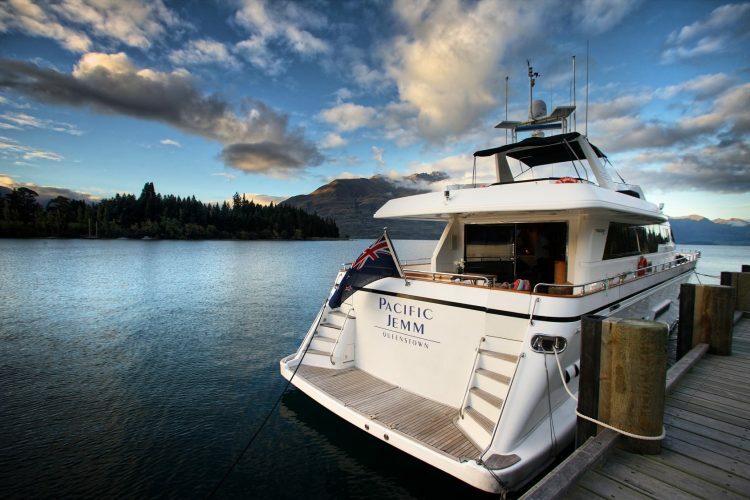 Those looking for the best in luxury land and lake will now be spoilt for choice as Eichardt’s Private Hotel announces its acquisition of the region’s first premium nautical offering, the Pacific Jemm. The 24-metre Falcon 80 S is a welcome addition to the Eichardt’s Private Hotel offering (including the country’s most exclusive accommodation The Penthouse), and will command upwards of NZD$12,500 for stays that allow adventurous travellers to see a truly unique side to Queenstown’s Lake Wakatipu. In true Eichardt’s style, the Pacific Jemm oozes old-world charm with smart teak finishes and plush in-built furnishings. Complete with all the modern amenity one expects of the hotel experience, the lavish vessel includes four luxury suites and has at its beck and call two crew alongside Eichardt’s’ famous chef who will prepare custom menus with an emphasis on locally-sourced fare. The acquisition is a coup for the Imperium Collection, owned by Christchurch-born businessman Andrew Cox, which has a strong-hold on the luxury boutique market of Queenstown with its two hotels, lakeside apartments, private residence and restaurants The Grille, No5 Church Lane and the revered Eichardt’s Bar. “We are thrilled to be able to extend our luxury experiences in Queenstown onto the water. The Pacific Jemm is currently undergoing a significant upgrade to bring it to the standard that our guests expect, and will offer signature experiences akin to the standard set by The Penthouse,” says Cox. Three expansive terraces provide the perfect vantage point to explore hidden coves, mountain vistas or insta-worthy backdrops looking back to the famous Queenstown bay. Options for cruising include scenic daytrips to Glenorchy and a helicopter over to the West Coast for crayfish before anchoring up to cook the catch. For the truly adventurous, guests can super-charge the experience with their pick of an Aston Martin, Lamborghini Gallardo Spyder, Audi R8 or Porsche 911 to race to Glenorchy before again being helicoptered over the Southern Alps, gathering West Coast delicacies and devouring the freshest Kiwi seafood aboard a cruise back to Queenstown. Custom fireworks displays over gourmet dinners that light up The Remarkables, Cecil Peak and Walter Peak mountain ranges will set the scene for intimate wedding or milestone celebrations. “As a luxury brand we are constantly looking for new ways to deliver incredible experiences and memories for our guests. “The Pacific Jemm will continue this tradition, ushering in a new way of luxury travel for guests seeking to discover what makes New Zealand truly world-class,” says Cox. With overnight stays starting from $12,500 per night for up to ten people, a stay on the Pacific Jemm is designed for ultra-high net worth individuals and families looking for a different perspective. Alternatively, day trips and private functions can accommodate up to 45 guests and will be custom built for each experience.